It took less than six minutes to deepen one of the gravest crises in the history of Boeing Co. 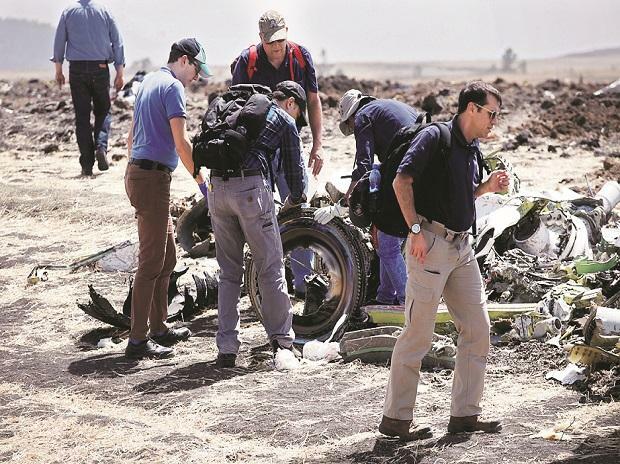 It appears to support a preliminary conclusion reached by Ethiopian officials and international investigators, who believe an automated flight-control feature activated before the plane nose-dived into the ground, according to people familiar with the matter. This emerging consensus—relayed during a high-level briefing at the Federal Aviation Administration on Thursday and reported soon after by The Wall Street Journal—represents the first findings based on data retrieved from the flight’s black boxes. It is the strongest indication yet that Boeing’s misfiring system was at the heart of both the Ethiopian Airlines crash earlier this month and a Lion Air flight in Indonesia, which crashed less than five months earlier. Both doomed jets were Boeing 737 MAXs. The two disasters claimed 346 lives. A report from Ethiopian authorities is expected within days. Pilots flying the 737 MAX around the world were alerted to the stall-prevention system only after the Lion Air crash, and saw almost no mention of it in manuals, according to the pilots and industry officials. Most didn’t have visible cockpit warnings that would have alerted pilots to a malfunctioning sensor, and they had no access to simulators that could replicate the kinds of problems that doomed Lion Air Flight 610. Ethiopian Airlines—Africa’s largest carrier—is fighting to defend its record. Across this vast nation of 105 million people, the state-owned airline has in recent years become emblematic of, and indispensable to, Ethiopia’s ascent from one of the world’s poorest countries to a regional powerhouse. The closely linked fates of carrier and country are now under the spotlight, raising the stakes for the airline to effectively manage the fallout of the accident. Minutes after the plane crashed, Ethiopian Airlines’ chief executive officer felt a buzz in his pocket. Tewolde Gebremariam was attending Sunday service with his family at the Medhane-Alem Cathedral close to the airport when his phone rang. It was the number for the airport’s “collaborative decision-making system,” a task force of airline, air-traffic control and airport officials who work together to ensure flight traffic is managed efficiently. “We’ve lost ET302 from the radar,” the voice on the other end of the line said in Amharic, Ethiopia’s national language. He notified the country’s prime minister, Abiy Ahmed, who first tweeted about the crash in Amharic at 10:48 a.m. local, just over two hours after the doomed flight had taken off. At 10:50 a.m., the news broke abruptly into the quiet Sunday mornings of the families of the 157 on board, and the rest of the world.